gorgeous card Sassy and just love all those flowers. I love LOTV stamps anyway, but you've made this card a stunner! This is so beautiful and delicate. I can tell you have a definite talent for making feminine cards. 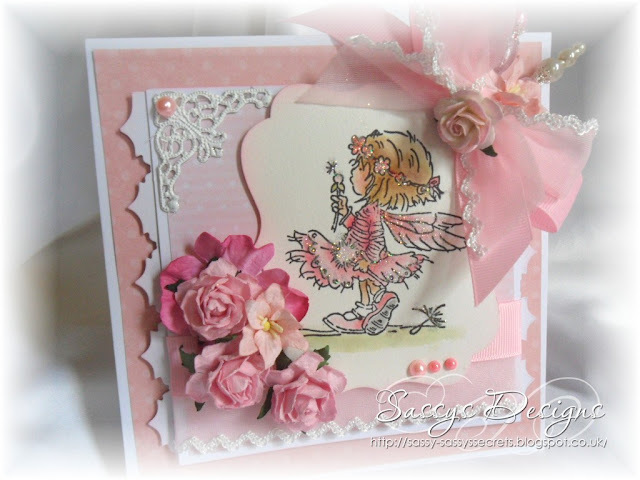 Gorgeous card Sassy, I like the sweet image that corner the big bow and the pins. Adorable card ,Sassy :)Luv the little stamp ... so cute ! So pretty Sassy. Love the pins and the delicious bow. Pretty in Pink! Love love love it! How Precious is this cutie. I really love the coloring. Adorable card! Love the sweet image and the lovely soft colors! Really pretty. Happy you joined us at CC&CC, come back soon! Aloha!